A super helpful resource for traveling with young children but many of the tips apply to everyone! I really enjoyed reading it. Depending on your style, you can order a paperback or Kindle version. I had a PDF for review purposes and found myself using the search feature on my iPhone to find specific tips while at WDW. My review. A fun gift for lovers of poetry and/or Walt Disney World. I love how his poems take you on a journey through your own WDW memories. My review. These two are from Tracie Cook, who I had the pleasure of meeting in October. She's combined her loves of teaching and Disney for these guides. I'm proud to have bought the first edition of this book and so happy for Steven Barrett that it's so popular that he's now on the 4th edition. He also has Hidden Mickey guides for other Disney vacation destinations. The Walt Disney World Trivia Book, Volume 1: Secrets, History & Fun Facts Behind the Magic Just one of Lou Mongello's books/guides that help fill the time between vacations and you might learn something to boot. What could be a better gift than a Walt Disney World or Disney Cruise Lines vacation? Kelly or Corby, two of our Minnie Moms, would be happy to put their passion for the Mouse to work for you. Free dining is still available if you book by December 20. Room only deals can be booked through the end of the year. And don't forget the Disney Dream sets sail in January 2011! Wall art, iPhone images, and soon...a calendar! Retro items from a great lady with an eye for treasures! 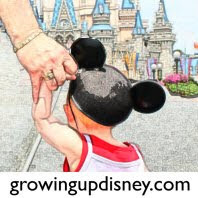 Ashley has kindly offered Growing Up Disney readers a 10% discount. Enter "DISNEY" in the coupon code at checkout. Make your camera strap more comfortable and stylish. The sky's the limit on fabrics. My review. Here are a few of my favorite items for travel with little ones. These would make great stocking stuffers for new parents. I reviewed this recently. Audrey loved GoGo Squeez at WDW and asks for them at home. I just reordered for holiday travel. Amazon has them for 62.5 cents each. My review. The closest thing we've found to a spill-proof cup. And they have fun Disney designs. The insulation is pretty good too. These are great when you are away from home. They clean up easily at the kitchen sink and dry quickly. They're also super light for throwing in the diaper bag. We've taken these to WDW and just about everywhere else. Audrey can have a snack (usually Cheerios) without making a huge mess. I got a small one for our last flight to WDW. Now I keep it in my purse and it's handy at the grocery store, waiting at a restaurant, in the car, etc. Of course, this is far too big for a stocking stuffer, but if you need a gift for a family who travels alot or just likes to go out to dinner, I can't recommend this enough. I reviewed mine once on the blog. We take it out to restaurants and Audrey sits in it much better than the germy high chairs which buys us more time. She also makes less mess due to the tray. It goes with us when we visit grandparents. I'll use it as a booster seat for Audrey at home when the new baby needs to take over our main high chair. My review. I hope this has helped spark a few ideas to complete your Christmas shopping! Thank you so much for mentioning my shop, Amy! Those stocking stuffer ideas are great! Photo Flashback - You've come a long way! Photo Flashback! They Do Exist! Wow, am I glad you're here!